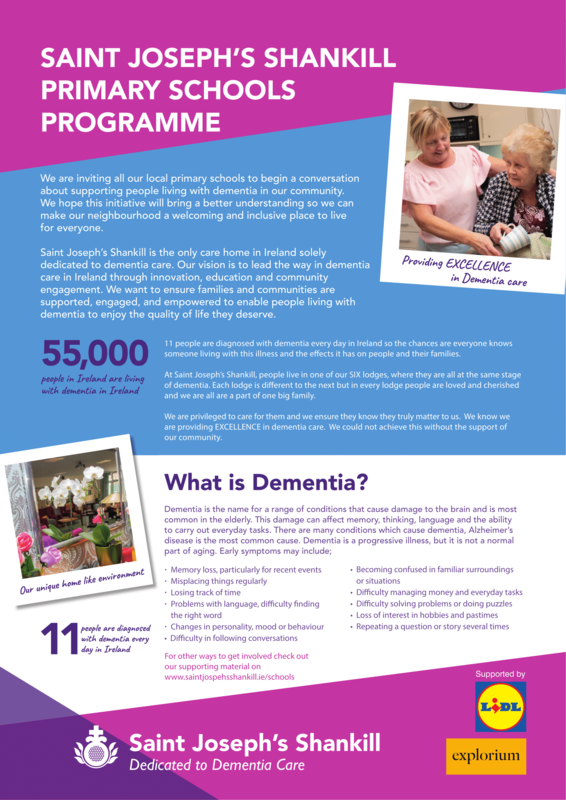 Saint Joseph’s Shankill; dedicated to dementia care, launches first ever primary schools dementia awareness programme. 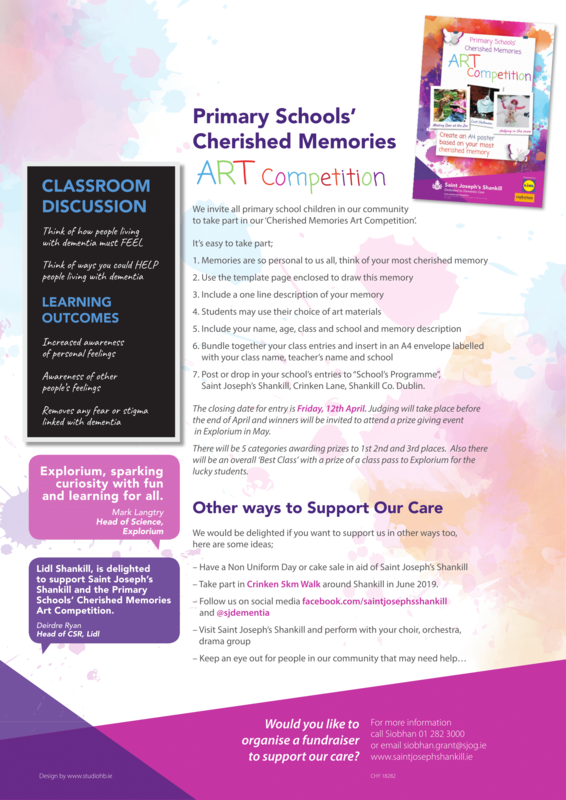 Primary schools in the locality have been invited to participate in the “Cherished Memories Art Competition” with the aim of the competition to establish local connections within the community, promoting Saint Joseph’s Shankill as a place for all the community to be involved in and to begin a conversation about dementia with our young people. Forty schools in total have been invited to take part, offering nearly 10,000 students the chance to be a part of this programme. 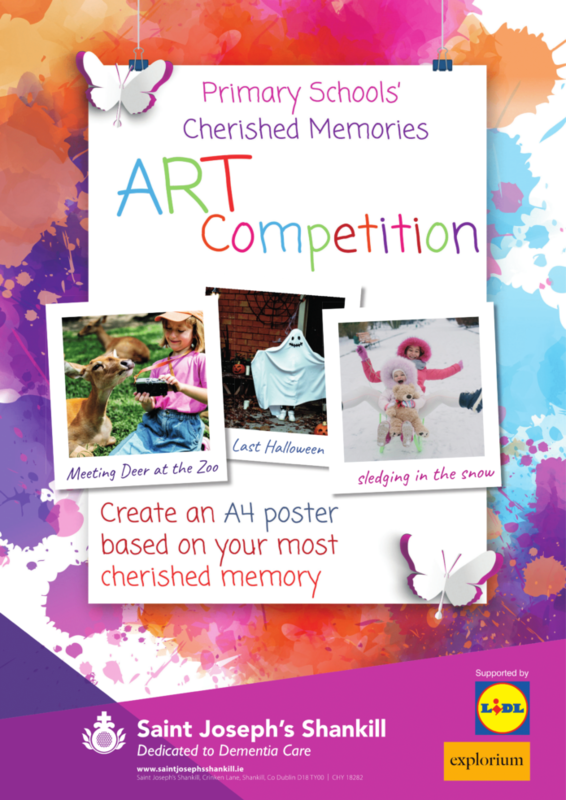 The competition will focus on cherished memories, and what memories mean to primary school children. Children will take part by drawing their cherished memory and write a few words about that memory explaining why it is important to them. There will also be a Best Class prize, for a class that has made the best effort collectively, and this lucky class will be awarded a day pass for the whole class to Explorium; The National Sports and Science Museum. Saint Joseph’s Shankill has provided some classroom discussion tips on their website www.saintjospehsshankill.ie for teachers to help their students delve a little deeper into what dementia means and the affects it may have on people and their lives, and ways to help them. 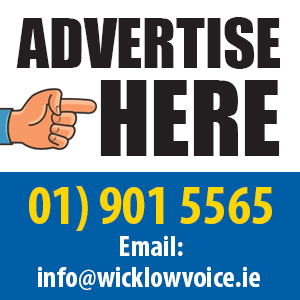 This is the ONLY primary school’s initiative promoting awareness about dementia in Ireland. Schools will have received their pack last week, and the closing date for entries is the 12th of April. Judging will take place throughout April and a prize giving ceremony will take place in Explorium in May where all the winders and their teachers and families will be invited to attend, alongside local and national media too. Saint Joseph’s Shankill, the only care home in Ireland solely dedicated to dementia care. Our vision is to lead the way in dementia care in Ireland through innovation, education and community engagement. We want to ensure families and communities are supported, engaged and empowered to enable people living with dementia to enjoy the quality of life they deserve. Saint Joseph’s Shankill plan for 2019 is to create greater awareness of the work of Saint Joseph’s, Shankill, create new programmes to support the carers and those people living with Dementia in our local community. We rely on the support of our community, not only through engagement and volunteering but through donations and fundraising to ensure we can continue to care in this way.